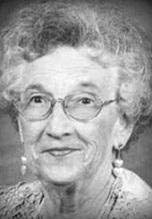 CEDAR FALLS, IOWA - Anne Lorraine Blanchard, 87, of Cedar Falls, died Sunday, June 24, at the Western Home Communities Elizabeth Martin Health Center. She was born December 6, 1924, in Cedar Falls, daughter of William Henry and Rhoda Latisha Rohrabacher Fowler. She married Wilbur A. "Curly" Blanchard on July 29, 1949, in Waterloo. He died June 8, 2011. Mrs. Blanchard was a graduate of Cedar Falls High School and was the owner/operator of Creative Printing, Waterloo, and Anne B's Ceramics, Cedar Falls. She was a member of Nazareth Lutheran Church and Phi Tau Omega Sorority. She is survived by a son, Craig (Debra) of Cedar Falls; a daughter-in-law, Joan Blanchard of Cedar Falls; five grandchildren, Erik (Ashley), Lucas (Danielle), Leah and Shelby Blanchard, and Tiffany (Jason) White; and five great-grandchildren, Kyler, Norah and Kellen Blanchard, and Alivia and Austin White. She was preceded in death by a son, Scott A. Services will be Friday at Nazareth Lutheran Church, with burial in Cedar Valley Memorial Gardens. Visitation from 4 to 7 p.m. Thursday at Dahl-Van Hove-Schoof Funeral Home, and for an hour before services Friday at the church. Memorials may be directed to the church, Cedar Bend Humane Society or Western Home Communities. Condolences may be left at www.DahlFuneralHome.com .